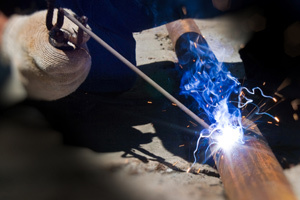 AN emergency physician has called for increased awareness of metal fume fever, which still occurs among Australia’s welders despite being considered a historical disease. Dr Anselm Wong, an emergency physician from Melbourne’s Austin Hospital, led an analysis of calls to Victoria’s Poisons Information Centre between June 2005 and December 2010. The researchers identified 85 cases of metal fume fever, also known as Monday morning fever, all among welders. Dr Wong said the true prevalence of the disease, caused by metal oxide fumes, is likely higher because it has non-specific symptoms and not everyone with the disease would have called the hotline. “There needs to be increased awareness among doctors. We found that the disease is not common, but it’s not rare”, he said. Most cases were likely to present to general practice or an emergency department. Symptoms include fever, chills, myalgia, respiratory problems, metallic taste in the mouth and headache. Dr Wong said taking an occupational history was crucial for diagnosis, because sufferers would have had exposure to metal fumes within 48 hours of presenting. Symptoms usually self-resolved with supportive treatment, but recurrent cases put people at risk of developing occupational asthma or chronic lung disease. “If a patient turns up to the GP on multiple occasions with “the flu”, and he’s an occupational welder, the doctor needs to consider metal fume fever and not just shrug off the symptoms as a viral illness”, Dr Wong said. He said doctors have a role to play in promoting prevention if the diagnosis of metal fume fever is made. The disease could indicate poor workplace practices and he suggested doctors recommend workplace improvements for patients with the disease. The research, presented yesterday at an Australasian College for Emergency Medicine symposium, found that almost all the cases of metal fume fever occurred in men. Zinc was the most common metal involved. The frequency of metal fume fever calls was highest on Mondays and Tuesdays, which supported the disease’s alternative name of Monday morning fever. Metal workers often develop a transient tolerance to metal oxide fumes, which disappears after a 2-day break from the job, hence the increased reactions on Monday mornings.